“Wings and Wheels—Fly In/Cruise In” first annual event of the Houlton Chamber of Commerce was held at Houlton International Airport on July 27,2013. This was a free event for community members to enjoy. There was an antique car show, many planes on display; and unexpectedly, a Jetliner flew in to refuel. The Forest Rangers and Border Patrol had their helicopters there for people to check out…a big hit! The Border Patrol also had one of their dogs there. Great music, food and lots of great vendors were enjoyed by all!! 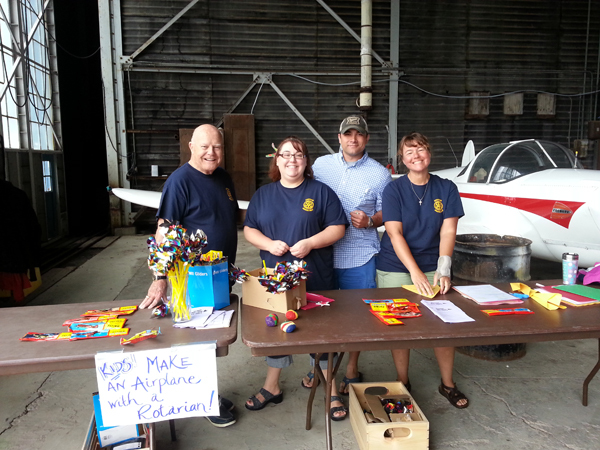 Rotarians helped kids make airplanes and check the wind with pinwheels before sending their craft out into the wind. Other Rotarians helped with parking, setting up and tearing down, and helping those unlucky few who got stuck in the wet field. Our Rotarians aren’t afraid of a little mud!! It was great to see “Rotarians At Work” helping out with a community event!! This is definitely an event that will continue with the Houlton Rotary Club’s support!